I am seeking information about USAAF Douglas A 20 G Havoc 43 - 9436, which I understand operated in the South West Pacific, specifically in Papua New Guinea. I would appreciate any information about unit, operations, markings, camouflage or related details. now that their two A-20 restorations are complete. In late 2004, the RAAF decided to no longer store this fuselage. Instead, it was transported to Precision Aerospace / Pacific Fighters Museum. Papua New Guinea (PNG) was a lousy place for a war. Looming, vicious mountains blanketed with an impenetrable rain forest and some of the foulest, most unpredictable weather in the universe worked to make it a pilot's hell. And Lt. Charles Davidson (USAAF) was descending into that hell, whether he wanted to or not. The first rule of survival was never, repeat never, to descend into the ever-present roiling mass of clouds that daily covered the 16,000foot peaks. Davidson knew the rules but was quickly being backed into an aeronautical corner as he circled above the clouds hoping for an improvement in the weather. Time, however, was against him, and Hell'n Pelican II ( A-20 42-86786 ) was running out of fuel. And it wasn't alone. Hell'n Pelican II was one of 222 bombers that had a late start on the mission to raid the Japanese positions at Jaufefa Bay near Hollandia in Dutch New Guinea; the other 221 were somewhere out of sight facing the same situation. All were caught in the daily afternoon buildup of weather, and 29 bombers would eventually run out of gas. But Davidson didn't know that at the time; and he didn't care. All he knew was that he was about to become the pilot of a 20,000-pound glider. As the A-20's engines coughed into silence, Davidson's luck took a turn for the better; he found a rare break in the low cloud cover. Dropping through the clouds, he was instantly pummeled by a tropical thunderstorm, but luck stayed with him. Rather than coming face to face with a mountain, a clearing in the thick rain forest magically appeared. He didn't bother with the landing gear, and at 1715 hours on April 16, 1944, Hell'n Pelican II slid to a halt on its belly on a thick patch of kunai grass near the tiny village of Amaimon. "Immediately on landing, I checked to see if the gunner, Sgt. John J. McKenna, had been injured." Davidson notes in his diary. "He was OK; not a scratch and I escaped without injury." After a long, harrowing jungle adventure, the crew returned to civilization. 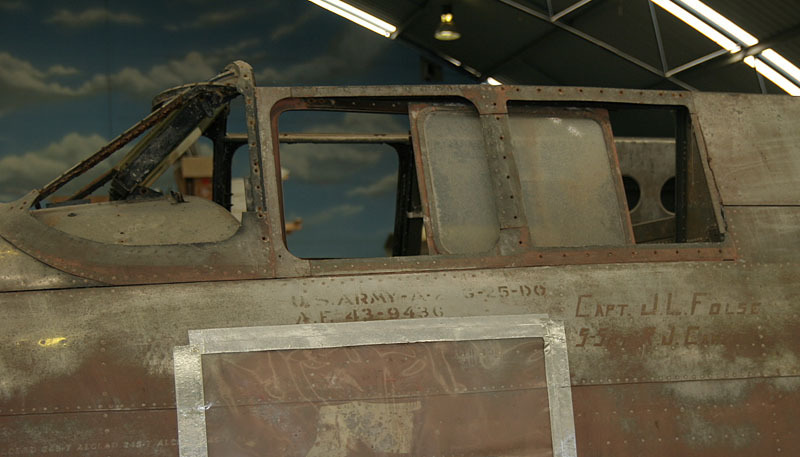 Hell'n Pelican II, however, was to remain a lost artifact of war for 40 years until it became the focus of an incredible rescue mission that eventually established it as the centerpiece of a memorial to all who had fought alongside it. After their less than graceful arrival in the jungle, Davidson wasn't thinking a half century ahead to what might happen to his airplane. He and his gunner had more pressing problems. After they had destroyed classified material, they ate the only "food" available-"We had some Charms and dry biscuits, [the] only food in the plane"-and then settled down for the night in the aircraft. Despite the possibility of discovery by the Japanese, this was preferable to lying outside, without cover, in the downpour. They rose at sunrise (0530 hours). "We got out the parachutes and smoke bombs for signaling in case anyone came over." They soon spotted an American fighter overhead and set off a smoke bomb. "The P-47 circled the area and dropped messages." But these were lost when they fell into the jungle; some A-20s also dropped messages, but these, too, went missing. Later in the day, a Consolidated B-24 dropped blankets, mosquito nets, a raft and instructions to try to join up with the crew of another A-20 (43-9628; recovered in 1985) that had come down some distance away. Unfortunately, the food that was dropped with the rest of the stuff also disappeared into the jungle. "We were instructed to make our way toward Lt. Joseph H. Gibbons and his gunner, who were also down. A map that showed our location near Amaimon, Gibbons' location and our course to reach them accompanied the note." They walked south in the direction indicated, but were caught by darkness and set up camp. "It was impossible to keep warm, and the water was soon over our heads at the campsite, so we found higher ground-with water to our waists." Soon after sunrise, they moved on, but on hearing voices they suspected were Japanese, they returned to their own aircraft. They had now been 48 hours without food. During the next four days, they were dropped regular supplies while they tried to make a landing strip by cutting and burning the kunai grass. Heavy and consistent rain, however, doused their fires and flooded the field. Eventually, the idea of flying them out was abandoned. In the meantime, the Japanese found the aircraft and tried to destroy it. "At 0300, April 19, two planes, presumably Jap recce ships, made a pass at the clearing where the plane was down, firing one short burst, about 25 rounds apiece. The ship was not hit. It was the first of three strafings on the plane." Though it caused little damage, it did, however, make the two Americans wonder whether a party of enemy soldiers might arrive unexpectedly. At last, more food was dropped, along with instructions that they should make their own way out. It was only a mile to the Gogol River where they could launch their raft, but it involved hacking their way with machetes through the thick kunai and making five trips to carry their food and equipment to the river's edge. This amounted to a 10-mile (16-kilometer) hike before they even started their ride down the river. They progressed cautiously downriver because of the heavy rain that obscured their vision and the interest that very large crocodiles showed by trying to attack their raft. The men had to use their firearms to drive them off. On April 21, "We saw our first crocodile, which was tremendous in size. It was about 20 feet from the raft when we sighted it. We proceeded with caution and traveled slower thereafter." A small observation plane spotted the two men on May 1 and informed them that the Australian Army had taken Madang and that a boat would be waiting for them at the mouth of the river. En route, they had to pass through an abandoned Japanese camp. Here they found "... about 30 or 40 Japanese bodies in the area, decomposing." Soon afterward, they sighted a Royal Australian Navy Corvette that took them the short distance to Madang, from where they were flown back to their base at Gusap. Their ordeal was over; the Pelican's was just beginning. Davidson and McKenna had made the entire journey under appalling conditions, and although they had had air support, this only lessened rather than solved their problems. Heavy, almost incessant, rain had turned the ground to mud and made the swollen river dangerous. It had also made it impossible to light a fire, and mosquitoes were a constant irritant. They were particularly lucky not to come across any Japanese who, although now wary of attacking even small numbers of Allied soldiers, would have found the two airmen easy game. They were full of praise for the support they were given by the Air Force during their stay in the jungle. Davidson survived the War; McKenna's luck, however, had run out. This had been his third crash-landing, and he was taken off operations and sent back to America. En route, in a cruel twist of fate, the transport in which he was flying disappeared into the Pacific Ocean. There were no survivors. The years passed, other wars started and finished, and by the early 1980s, the world was nominally at peace. Then, in 1984, interest, opportunity and funding coincided, and the RAAF was able to fulfill a long-held desire to recover and reconstruct an A-20 to represent the Bostons (British name for the A-20) used so effectively by No. 22 Squadron. The type was particularly attractive to the RAAF because Fit. Lt. W.E. (Bill) Newton had won the only Victoria Cross gained by an Australian airman in the Pacific theater while flying with this squadron. Funding was made available by the Australian 1988 Bicentennial Project, and the recovery exercise that targeted three aircraft was designated "Venture One." Additional "Venture" teams went to PNG over the next 10 years. One of the designated aircraft-no. 786, Hell'n Pelican II-had been rediscovered in 1976 by Mike Claringbould, a warbird enthusiast; however, not until September 1984 was a recovery operation approved and organized. The project originated as part of an offer from the PNG government to allow the RAAF to recover Jessica from Vivigani airstrip on Goodenough Island. This offer was gratefully accepted, as the aircraft, which had been badly shot up over the target on September 12, 1943, had actually been flown several times by Bill Newton. As it came in to land, only the port main wheel would come down. The Boston was still doing 60mph (l00kph) when it ran out of runway and the fuselage split into two during the resulting sudden stop. The aircraft was pushed into the aircraft dump and stripped for spares. Further talks led to the decision to recover additional Bostons to facilitate the restoration of two aircraft, one of which was to be returned to PNG. An RAAF team commanded by Wing Cmdr. Tom Kelly and accompanied by Claringbould was ready to leave for PNG in September 1984. Transport was supplied by a Boeing Chinook heavy-lift helicopter of No. 12 Squadron RAAF. The Chinook was selected because it had the necessary muscle to lift the Bostons from their longtime graves. The operation got off to a bad start, however, with a 24-hour delay, when one of the Chinook's engines acted up. Everything went downhill from there, with one stroke of bad luck after another. This included an engine going "south," stranding the entire crew 50 miles from civilization. When at last they arrived at the crash site, time was running dangerously short. It had been eight years since Claringbould had cleared the area around the crash site, so when the rescue team arrived, they found that the local vegetation had moved in and again reclaimed the aircraft. A search team consisting of Wing Cmdr. Tom Kelly, Warrant Officer Bob Eley, Flying Officer Gary Hillier and LAC Richard Bryce was flown in and dropped off a little more than a mile from Amaimon village, but it took them three and a half hours to cut their way through the jungle to the crash site. They spent the night at the village, and the next morning, they reached the aircraft within an hour. It was in remarkably good condition, although many of the instruments were missing. During the Venture One operation, the team had attempted to lift one wing and engine from another A-20 43-9628 at Wabusarik, but the engine had broken away and caused the recovery net to swing up dangerously close to the rotor blades, so the wing had to the abandoned. They hoped to have better luck with the Pelican. On September 29, 1984, 10 days after the recovery team arrived at the site and 50 years after Hell'n Pelican II had made its unplanned landing, the Chinook attempted to lift the A-20 free. After three tries, the big helicopter eventually lifted it clear of the ground but was unable to clear the treetops. Hell'n Pelican II, like a diffident mistress, had thwarted another overture and had to be lowered back to the ground. It was obvious that the weight of the airframe had to be reduced; it was the best preserved of the available Bostons, and the team were determined to get it out. Frustration led to frayed nerves and short tempers, but they stuck to the task of putting Pelican on an impromptu diet. Even so, it took a day and a half to remove the twin-row radials. They also had to clear all the vegetation that had overgrown the airframe. Then, on October 1, the airframe minus the outer wing panels and engines was transported to Madang airfield and loaded on to HMAS Tarakan, which was waiting to take it to Australia. Hell'n Pelican II had been rescued. After being shunted around to several aircraft depots that were too busy to complete its restoration, Pelican was transferred to the Apprentice Training School (ATS) at Wagga, New South Wales. ATS had just finished restoring a Mitsubishi A6M-5 for the Australian War Memorial and was ready for a similar project that would give the apprentices an opportunity to carry out a type of work outside their usual experience. Additional A-20s arrived in 1985, and work continued at a steady rate. Hell'n Pelican II was eventually finished by No. 23 City of Brisbane Reserve Squadron. In 1994, the project was given a major boost when a previously undiscovered A-20G-43-9436-was found in a freshwater swamp. It was retrieved by a Mil-26 heavy-lift helicopter and flown to Madang, where it was collected by an RAAF C-130 and taken to Amberley, near Brisbane, Queensland. This aircraft supplied many of the smaller fittings the other aircraft lacked. Pelican and the RAAF Boston were both restored in time for the RAAF's 75th anniversary celebrations and were officially handed over on September 12, 1996. Aircraft 42-86786-restored as Hell'n Pelican 11 of the 388 Bombardment Squadron (Light) (it originally flew as Louisiana Belle with the 3rd Attack Group)-was presented to the PNG government and was shipped to the National Museum in Port Moresby soon afterward. Aircraft A28-8, Jessica, was handed over to the RAAF Museum at Point Cook on the outskirts of Melbourne, Victoria, 53 years to the day after it had crashed on its final mission. During the hand-over ceremony, Charles Davidson, Hell'n Pelican II's pilot, stood at its side along with Harold Rowell, Jessica's last pilot. Davidson said, "I am proud that I have been able to serve my country and all who believe in the God-given right of freedom. My personal prayer is that history will always remember with respect and gratitude my gunner, John, and all the men and women who have given so much for the preservation of freedom."